Winbet is one of the most popular casino companies and has recently offered sports and casino bettings. Winbet started in 2015 and now has more and more consumers trusting those company, as a preferred bookmaker. In addition to the standard desktop version of winbet.bg, a mobile version for Android and iOS systems has been developed for customers. Those, who prefer to play on their phone’s browser can enjoy almost all of the options, without installing anything. They can simply load the site on their mobile device. The mobile version is very good in design and easy to use. Still from the company have not offered a mobile app for Android mobile devices and tablets, as well as for iOS system. You can now use the desktop or mobile version of the site on your mobile device. 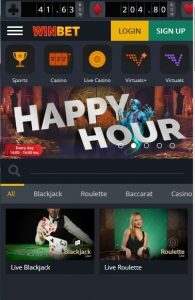 The mobile version of the site can be loaded from your preferred browser and after you enter the mobile site, you can see the Sports, Casino, Live Casino, Virtual + and other virtual sports buttons. Above them are the main menu, the logo of the company and the buttons Login and Registration. We can say that as a color layout, the site is well-designed and you can easily navigate with a few clicks to reach the desired position for a bet. – Sports – When you click on the sports match button, you can see a list of the leading sports you can bet for Today, Tomorrow, Week or any other period, that appear on your left side. You have a choice of: Football, Tennis, Basketball, Volleyball, Snooker, Ice Hockey, Handball, E-Sports, Special Sports and more. In the sports section you can bet on different positions and we can say, the mobile version is fast, giving you both the standard and the Cash Out option. Let’s open a football match. We see the opportunity to bet on 1×2, goals, handicaps, multiple bets, such as winner and goals, goals with correct scores and many more. The live section is also up-to-date and offers game tracking schedule, and with a good internet connection, you can watch the game live.We can say Winbet’s odds are good. – Casino – In casino you have the option of betting on a standard casino version, casino games, slots and many prize tournaments. In the casino you have access to all features and games, as well as the standard version. The support chat option that is at the bottom of the screen is very good and if you have a question to contact a company associate, just click Chat. One big plus is that, when you choose a live casino, you have the option of playing with a live dealer with your mobile device, regardless of the Android or OS. What is missing in the mobile version of the site are table games, bingo and Keno. Bonuses are one of the most popular betting promotions and almost every player wonders how many bonuses are offered and what is their types. Here is a 100% Bonus Casino up to 150 euro and 50% bonus for sports up to 50 euro. Let’s explain how you can get the full bonus in sports or in Casino and why not in both bonuses. In Bonus Sport, you need to deposit 100 euro in order to claim the full bonus with the bonus in this case being 50 euro. In the casino section, when depositing 150 euro, you will have the full bonus amount of 150euro. Please read the terms and conditions for Winbet’s Bonus Promotions. The bonuses available on the standard version of the site are also available on mobile, so here whether you will sign in a website, on a desktop computer or a mobile device, such as a tablet or smartphone is not relevant to claiming bonuses. When depositing and withdrawal funds, Winbet has endeavored to offer many options with some of the most popular methods being: Debit or Credit Cards with a minimum amount of 5 euro and maximum 5000 euro, EasyPay with a minimum amount of 5 euro, ePay .bg, min. 5.00 euro, Bank transfer minimum 5 euro and maximum 50.000 euro, as well as with Cashterminal device. When choosing EasyPay, you can load your player account within minutes in those payment system visiting office and it is important to provide the code that is generated from Winbet’s site. Bank transfer will take several days to wait and with other methods, the deposit is almost immediately. Winbet offers some of the most modern and current payment methods, which is a plus for the players. We would say, that the company offers a modern, well-crafted mobile version of its site and despite no provided mobile app, even novice players would manage registration, deposit and withdrawal.